Picking the best saddle bag for your road bike can be hard sometimes. Because there are literally hundreds of them in the market today. Don’t worry though, because I’m here to guide you how to get the right one and also provide some options for you to consider. If you want to quickly jump ahead, then use the navigation table below. I’ve provided a list of the best road bike saddle bags for you. So there’s a good chance that your next purchase is right just below. They range from premium to value for money and large sized ones if you need more carrying capacity. The Scicon Elan 210 represents the best value for money in all our saddle bag picks. Compared to others, this one is remarkably small, weighing just 38g. There is enough room for a set of tyre levers, multitool and a spare tube. It uses a Velcro strap for a simple and easy mounting system. 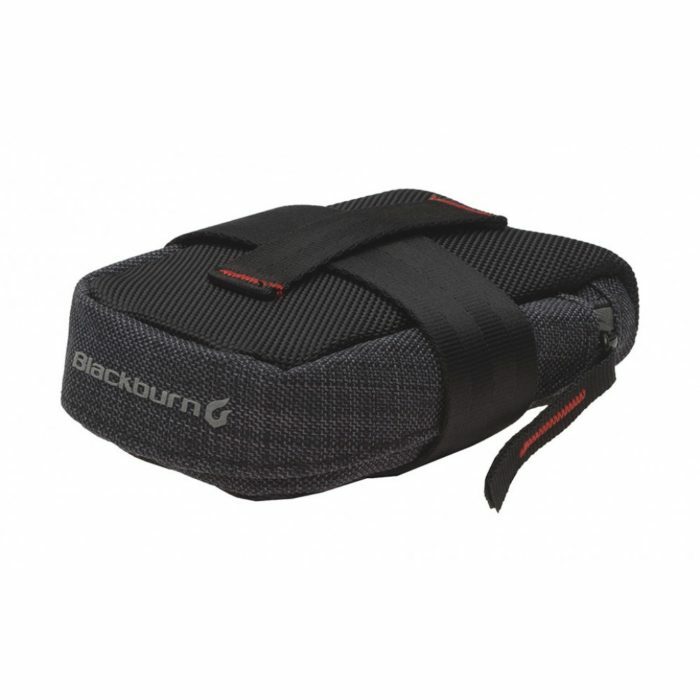 The Blackburn Central Micro Seat Saddle Bag is a good alternative if you’re on a budget. It’s small and compact, weighing just 68g and made of 600D polyester. It has enough room for a spare tube and a pair of tyre levers. There’s also an interior pocket in case you’d want to separate your stored stuffs. 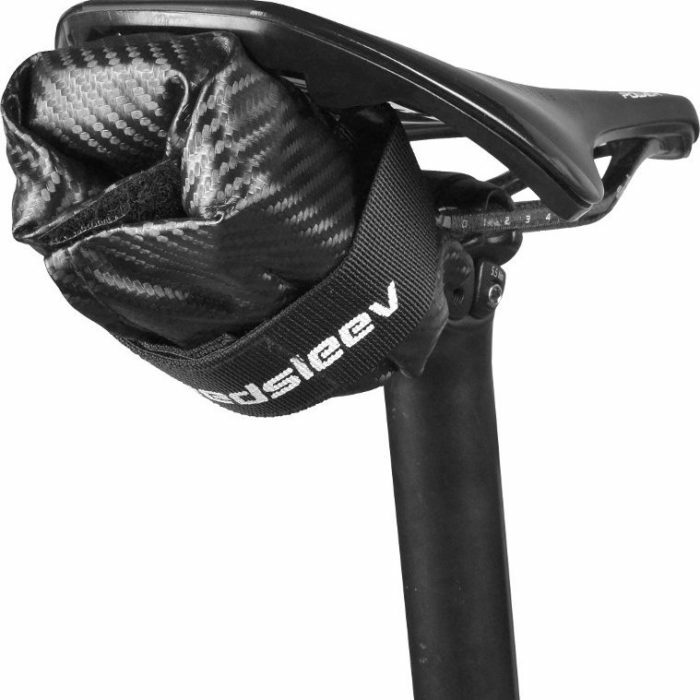 Despite its affordable price, the Lezyne Road Caddy Bicycle Seat Bag is packed with remarkable features you wouldn’t want to miss. 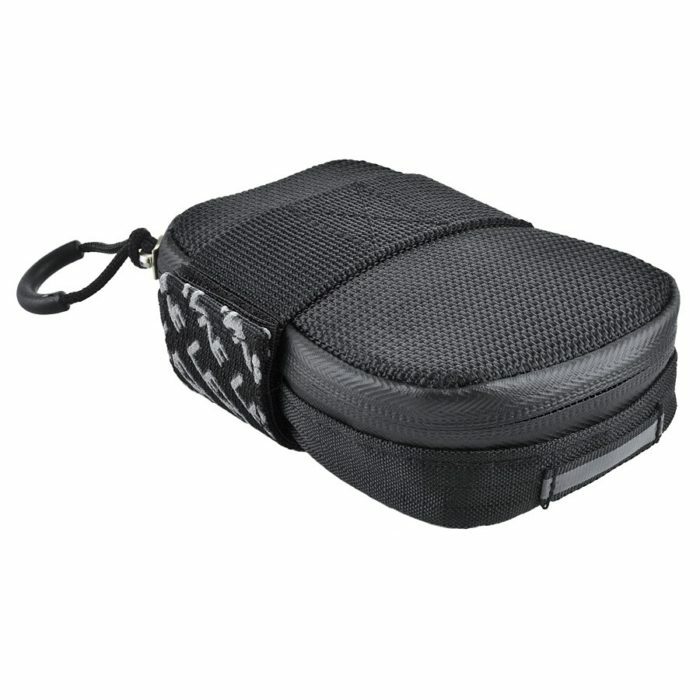 This is a waterproof and very durable saddle bag made of high-grade nylon fabrics. 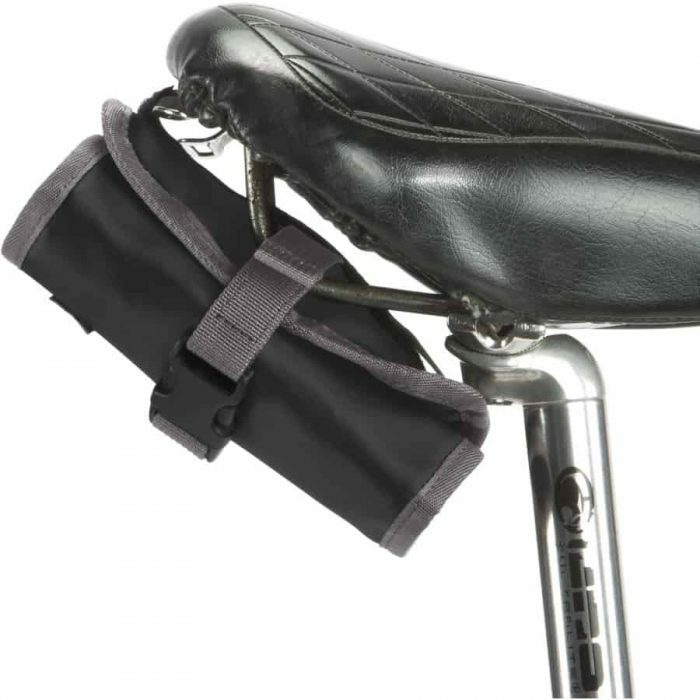 It uses a thick and strong velcro strap for mounting below your saddle. There’s also an internal pocket for you to keep your keys and other smaller stuffs. 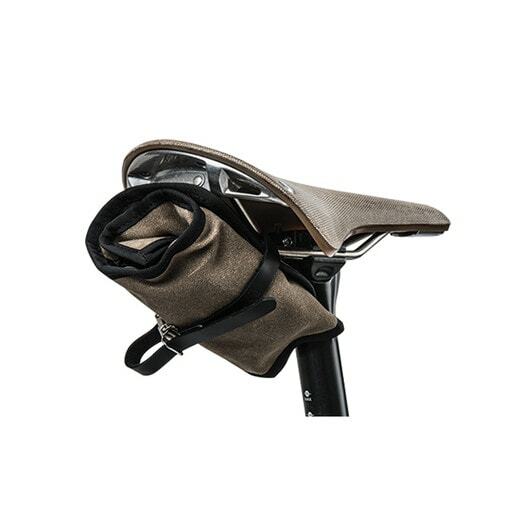 The Silca Seat Roll Premio looks nothing like a bike saddle bag. But, actually it is. It has a BOA dial which helps to keep things tight and snug. There is a flexibility for you to micro-adjust the tightness according to your liking. It’s made with cotton canvas and is coated in hot-melt wax to make it waterproof. It’s definitely one of the best looking ones around, albeit pricey. The Fizik 00 Saddle Bag is the modern version of how a road bike saddle bag should look like. From afar, it looks far from a saddle bag, but it can hold most of your essentials while you’re riding. It’s made out of thermoform construction that promises to be lightweight yet durable at the same time. To keep your things safe and dry, it features a waterproof closure system and rubberized zipper. 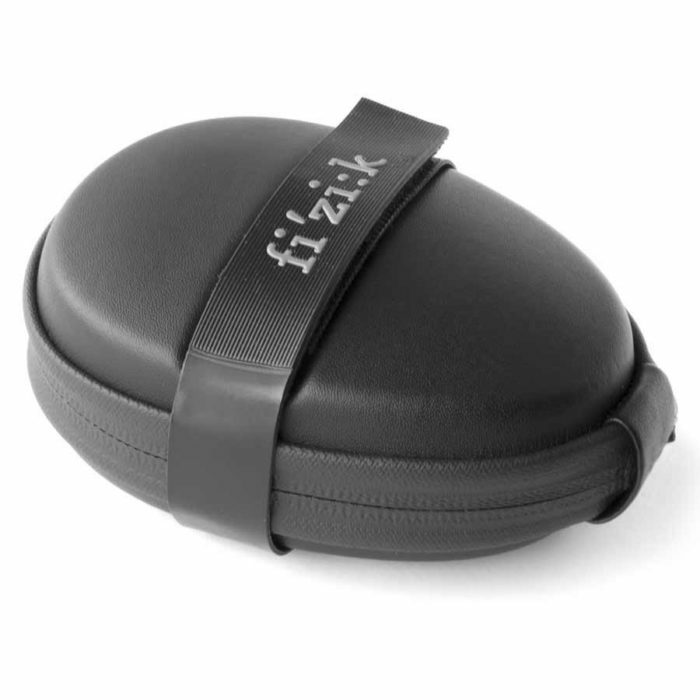 If you’re currently using a Fizik saddle, this saddle bag blends in seamlessly. Cyckit is a New Zealand based company that specializes in producing high quality, plastic moulded saddle bags. The Aeroclam saddle bag combines a highly functional, well thought through design with good aesthetics. 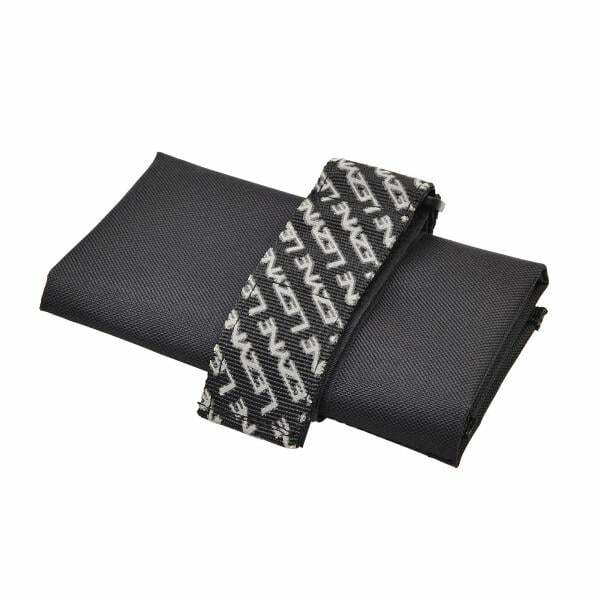 It looks will good on your saddle and only come into contact with your saddle rails. Nothing else. It’s available in a small (regular) version as well as a large version which can store 2 tubes and a CO2 canister comfortably. It’s one of those cool saddle bags that many cyclists don’t know about, but would definitely want to get their hands on one once they’ve seen it. The SpeedSleev Carbon Smuggler is available in colors of black carbon and blue variations. It has a small to medium capacity compared to its competitors. It deploys a minimalistic approach when it comes to design along with a double closure Velcro system to ensure a secure fit. It’s made from water resistant nylon fabric which would keep your things dry for most of the time. Arundel sells their Dual Seatbag in 6 color options, namely: black, grey, yellow, blue, pink and red. The name pretty much says it all, the dual in its name means it has enough room for 2 tubes, 2 CO2 canisters and tire levers and other essentials you’ll need for your bicycle. The overall body is made from nylon but, there’s an area in its body where is has a small leather patch for aesthetic purposes. Want a slightly larger saddle bag? Then go for the Castelli Undersaddle XL. This one isn’t your typical saddle bag because of its larger capacity. It can store multiple CO2 inflator kits, patches, spare tubes and many more. To assure that your things are protected, it uses wheel-spray and covered zipper. If you’re in for a long bike ride, you might want to consider this saddle bag. The Aero Wedge Pack is another Topeak product you’ll surely love. It’s made from a durable 1200D polyester that features water-wicking capabilities. It’s compartments are expandable when you need extra storage space. With an overall capacity of 1.97L, you won’t run out of space for all the things you carry along for a long ride. To ensure your safety at night, it also includes a 3M reflective strip and a mount for your rear lights. 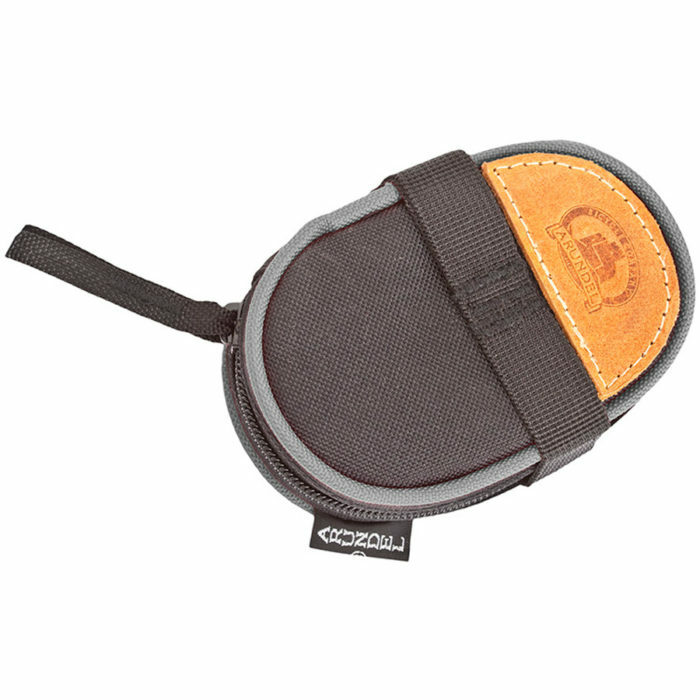 This saddle roll comes is made with durability in mind. The exterior is made of waterproof tarpaulin, while the internal is made of durable nylon fabric. There are 3 internal pockets of different sizes that can fit tire levers, patch kits, CO2 inflator kits and even smartphones. In the middle is an elastic strap that holds your spare tube. It fits securely over your saddle rails via a buckle closure system. This saddle roll oozes the classic looks. It’s made of durable waxed canvas and will survive harsh conditions with ease. There are 4 internal pockets to organize your tubes, tire levers, mini tools and keys. There’s even a zipped pocket for your cash and IDs. Best of all, it comes with a lifetime manufacturer warranty from Blackburn. It’s single velcro strap, hook and loop system makes it easy to mount on the saddle rails. Furthermore, the velcro strap can be removed if you want to keep them inside your jersey pockets. For me, the materials used to make saddle bag is a huge make or break. It’s extremely important to assess its quality and overall durability. For one, I’d like to buy something that will last for a long time and if possible isn’t that pricey. Secondly, I’d like to think that even if it rains, my things will still be okay. So it’s vital to have a water resistant, or better still waterproof saddle bag. 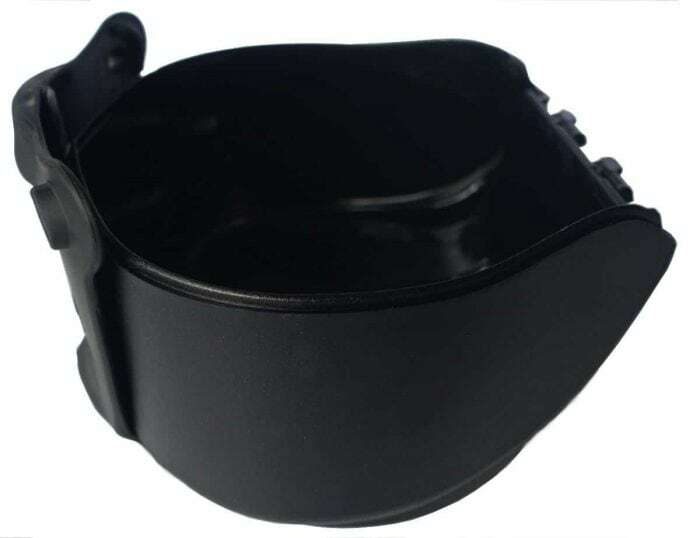 Today, most saddle bag are made of nylon, polyester, leather or sometimes synthetic rubber. Nylon are known to be weatherproof, and can easily wick liquid. Polyester are mostly acknowledged to be tear resistant, which guarantees that the saddle bag will last for a really long time. Leather are used on the saddle bag’s exterior is also popular for their durability. Synthetic rubber materials are also good for their rainproof capabilities. Another significant point to consider is the storage capacity. You might not have realise it, but the overall storage capacity of a bike saddle bag is a big deal. An extra pocket is a huge bonus and may go a long way to help organize your stuffs and accessories. Fortunately, a lot of saddle bag manufacturers make them in multiple sizes, so you can decide the right storage capacity for you. 1. 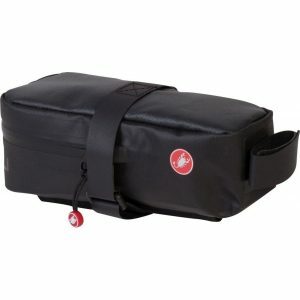 How do I decide which size of saddle bag to buy? 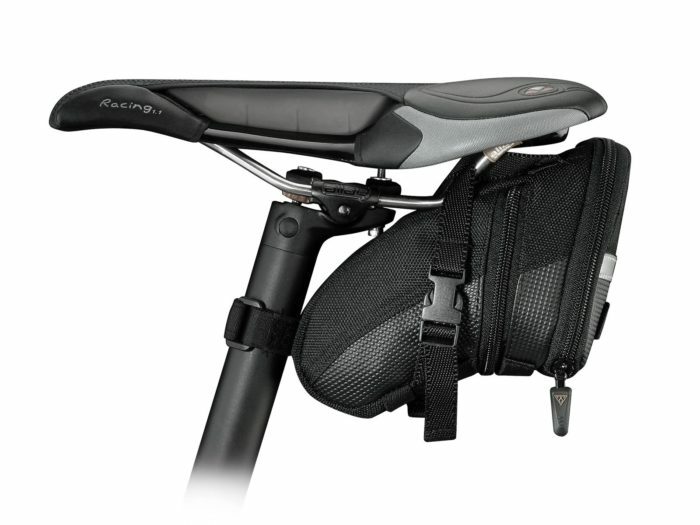 Generally, there are 3 saddle bag sizes available. I’d categorize them as Standard, Large and Extra Large. Standard. 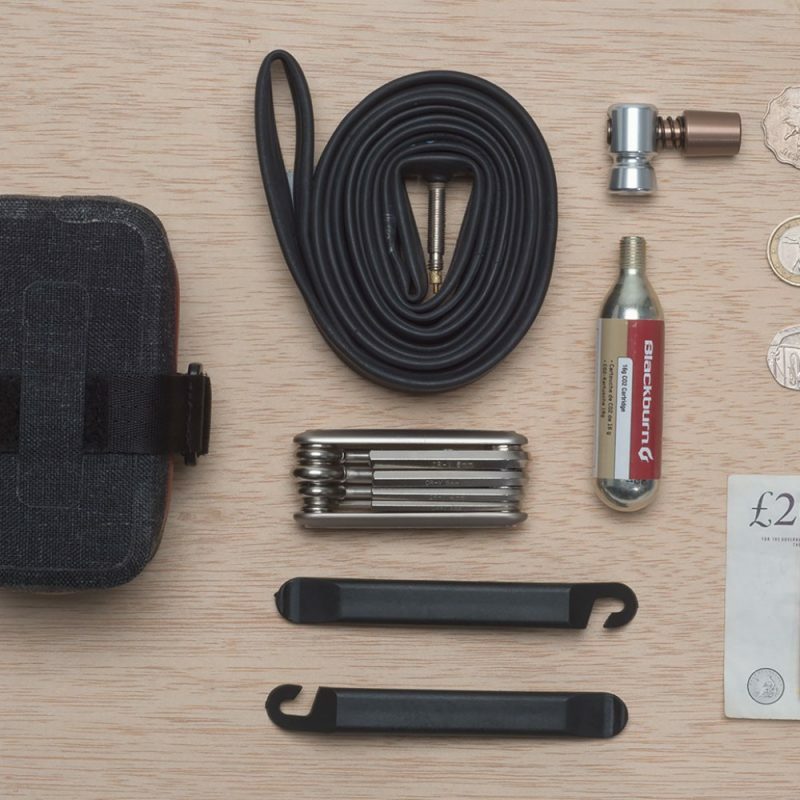 These are the ones which will fit a spare tube, 2 tire levers, a CO2 cartridge and perhaps 1-2 more small items you might carry with you. Large. On top of what can fit in a Standard saddle bag, they typically can fit another spare tube inside. Maybe you could fit your mobile phone inside as well if it’s not too big like the plus-sized Samsung and iPhones. Extra Large. These are mainly used by people who are on a road or backpacking trip. You can expect to fit 1-2 piece of clothing and 3-4 more other essential items in addition to what I’ve just mentioned above. 2. What are the essential items to carry in a saddle bag when out cycling? At the minimum, you should have a spare tube (make sure it’s new) and 2 tire levers. Optional items are like a CO2 cartridge if you don’t use a pump and patch kits if you’re going for a long, solo ride. I’ve written a separate article about what’s inside my saddle bag here. 3. 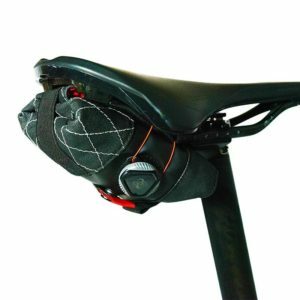 Should I buy a waterproof saddle bag? From my experience, that’s not a must. However, it also depends what you carry inside. Most of the things found in a saddle bag would still be fine even if its wet, except for mobile phones and clothing. Most saddle bags are made of nylon or leather and they’re not waterproof. At best, they’re water resistant. But if it’s a heavy downpour, the contents will get a little wet, which is fine.